fingers crossed that this posts properly! i'm pre-writing and showing off my wedding gift for ben & lindsay, who just happen to be getting married on my *birthday*! best party ever? oh yeah. and i'll never forget their anniversary. luckily, with typing this up in advance, i can't get too sentimental. that and seeing as we leave for the airport at 4 am in a few hours - words fail me. 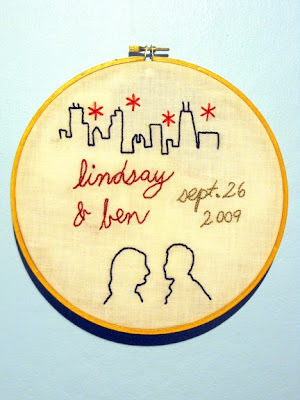 they made their invites with their silhouettes and the chicago skyline - i just traced it and embroidered it as best i could. i love you guys!!! here he is! i was able to consult with marc this morning over buttons v. felt, and we ended up liking the buttons that looked like felt anyway. felt it is! i also needed the help to have some time with the owl to get his face on, because colden is already very attached. i've been reading some other crafty mamas' blogs, and it seems universally true - if you've made it, the little ones love it even more from seeing its making. so, i still have to stuff him, and i would like to get my ravelry account more active and share him there as well. 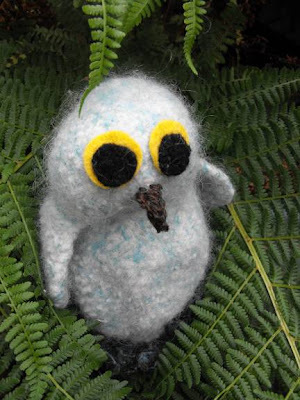 but essentially, he has been an owl since his first felting. don't tell cole i took him outside (the owl stays inside) for this photo. i just don't want him in the sandbox! another project still 'on the needle', so to speak, before we leave for the midwest tomorrow. i might try to set up a post for that one to reveal itself at the right time. or i will just concentrate on finishing it and not get any blogging in for the next week! either way, i won't have as much computer access over the next few. til then! so, i finally made it out to knittn' kitten (no, i hadn't been - i know! i know! ), and since i've heard that they are in need of customers, well, i went ahead and splurged a bit. i think you can see all the price tags and figure out that my splurge was still quite the bargain! i don't know what i will do with the yarn yet (except maybe go back for more), but i have something in mind for that suede cord. yep, mouse tails! maybe i ought to knit a cat with the yarn. you know, just so the kitten receives due respect. as for the ribbon, well, it was too gorgeous to pass up! i don't know how i made it out of the vintage linens room without even a handkerchief! once i find my swap partner out, i'll definitely have to return! 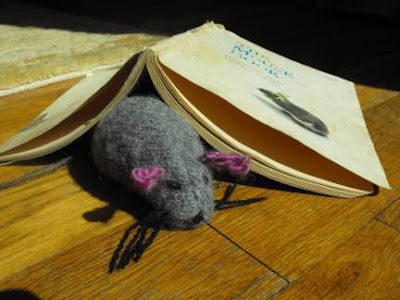 this qualifies as a completed project from the pile because i had a small mousie printout from long ago sitting on a stack of grey felted sweaters. i had a similar looking one from germany as a child - until my cat got it. naturally. this is one drawback to the toy intended for children (not cats). however, he still needs some work, so although this guy is finished, it's still on the to-do list. i think the next incarnation will include some actual wool felt ears (instead of crochet), and a slightly bigger, perhaps tapered, tail. i'm open to other suggestions. here he is hiding under an adorable church-rummage sale find (25 cents, i think). one of my primary motivations in going to this lecture was to give susan some buttons that i knew she would appreciate a thousand times more than i. it was lovely to hear the experience of these women, and they were all extremely, incredibly gracious. i felt surprisingly shy when i approached them after the talk with more button gifts - attached to a homemade card. especially because my only pink vintage buttons for alicia were an incomplete card, and diane promised to visit my blog. so kind. she is absolutely a god(dess)-send in crafty portland. marc was working, so i had colden with me, and it was kind of challenging to be aware of how much noise was too much. i asked the woman facilitating to let me know if we were getting too disruptive, but she was so nice as well! i think she let us slide quite a few times. 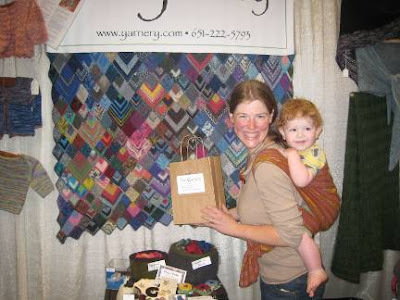 we were lucky enough to get a little play in with another babe - and we shared a little handmade love too. here's a snapshot of the event from someone who was paying a bit more attention: wendy at build/make/craft/bake (and i only found this post courtesy of diane - again, such a blessing!). i also made it out to the skating with scissors event that wendy mentions and talked with a lot of lovely crafters. many of whom i met at crafty wonderland earlier this month. i'd like to feature some of their work on here too... maybe a sidebar to come? hmmm. p.s. sadly, i didn't make it into oct.'s crafty wonderland show, but i'm hopeful for the future. now let's see if i can give an inkling of the fabulousness that was - i was all a-swoon, so it may be something of a blur. after a zombie-like pass through of the marketplace (actually i think i accidentally kept going the same route a few times looking for this specific shop...), i asked the people up front for help locating the yarnery. this was the place i went to buy yarn in college. it was the place i purchased an insane amount of encore to make marc a blanket (at the time, i thought he was allergic to wool - some sweaters just make him itch. oops). it's sort of like where i learned to knit, and i still have some patterns i bought from their stock of singles. sentiment aside, i still had a card with store credit - and things being how they are, well, the longshot of presenting this tattered card was within my capacity. still good! i almost wept, i swear. and i almost bought up a skein of that bright green mohair that i made into a beret back in the day. that hat made everyone think my hair was lime green (it was purple, well blond then purple...then black. ahh, college). i put it back, cause i can actually get that yarn anywhere. what i did get were some awesome felted patterns, locally designed in mn and found online here: woollysomething i linked to the page with the patterns i picked, though she has many more. i chose the owl and the gnome + mushroom. 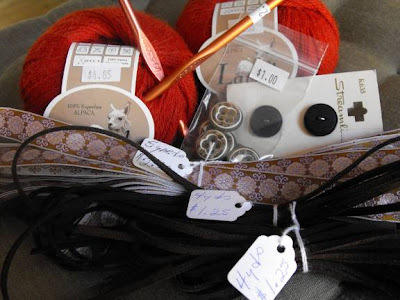 and i couldn't resist running to my local yarn store (lys for those of you into it) with a frequent buyer gift card to get yarn for the owl and start knitting it up! yes, another project in the works... and not yet finished. hee hee. 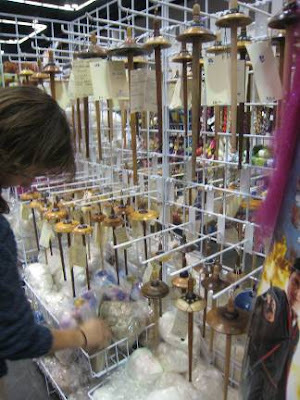 so the next thing i remember (and i could be wrong here), i was dazzled by the display of spindles, next to a harry potter poster that made me think they might be magic wands. lo and behold, they are! not only that, there was an amazing sorceress spinning away nearby, and she actually taught me how to spin there on the spot. when i am blessed with more fortunes, i will be bringing my business back her way, because she was incredibly nice and wonderful and she had some absolutely beautiful fibers. you can check out her wares here: fiberoptic i can't thank her enough for taking the time to teach me! so spindles, it turns out (ha! ), are not only spinn-y. they are rather spendy! i kept trying a small (cheaper) one, but it wasn't working out, and kimber (fiber optic yarns, see above) told me that you would know when you found your spindle - maybe i would even like a turkish spindle that makes a ball with a center pull? whaaa? i was actually very attracted to one in particular, but went home to talk it over with marc and play the gamut sunday. i ran into a friend from lll, whom i didn't know was a fiber artist, whose fibers i am also ogling! our babies (who are now more accurately described as boys, really) are close in age, so perhaps we will be able to connect again for a playdate (that *may* include wool...). her shop is here: knittedwit and she has a blog link there as well! it also just so happens that she connected with the lovely people of the yarnery, who are now carrying her fibers! yay! she also pointed me to a 'rock & rest' room where colden and i could take a break. he kept saying, "more yarn! more ladies! boys?" the boys were fewer and farther between, but we met some. we also did a quick viewing of the sock museum. i took pictures, but they're so inferior, that i won't share them, just visit the site. 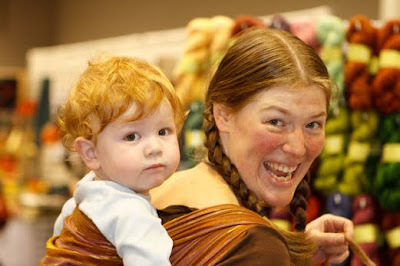 at that point, it was clear that colden was pretty tired of being wrapped on my back, and we had to get out of there. on our way, i saw those infamous ravelers (jess & mary-heather, specifically), and was so struck i couldn't even say hi back. eek. then i saw the yarn harlot conversing with another sock summit team member that i probably should have recognized, and i was floored. i had no idea i would be so starstruck. i don't seem to have a picture of the spindle, but you are sure to see it here in spinning adventures to come. right now all i have to spin is the rest of that beauteous camel/silk and some straight up white wool roving (though i am dipping my toes back in natural dyes again... so it could become something incredible too). the stats on the spindle, for anyone who might be into this sort of thing, are: whorl: 2 3/4; mulberry (israel) w/ ebony- inlay: silver - shaft: 10" goncalo alves - weight: 40 grm 1 1/4 ozs. - made by avi wasserman, hand-crafted dropspindles in israel. purchased atthefoldatmc (if you're looking, it has dots on it and is similar to 7, 14 and 15). intense, huh? i also went back to the boys of laurelhill for a treat. i chose an ebony crochet hook, made from an old instrument. all of their fancy wood needles are made from salvaged finery - instruments, furniture. and beautiful. the double-pointed sock needles made of forest palm were slightly bendy, which could be advantageous if you end up sitting or stepping on your needles (ahem), but boy did it feel strange to knit with them! 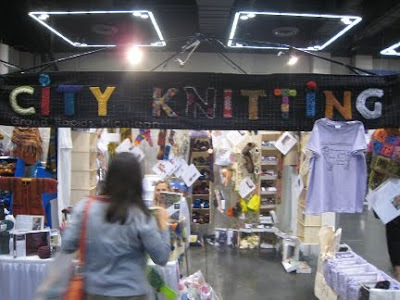 you probably can't see all the great things in this booth below (city-knitting), but i took a picture hoping to get a good shot of their banner. each letter knit up differently in a really eye-catching and sweet sign. 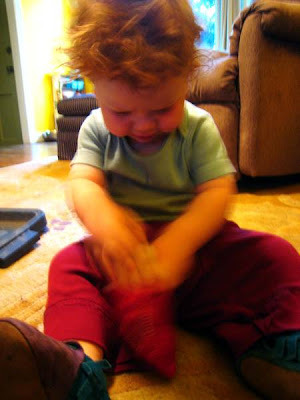 i actually bought a pattern for felted bootie/slippers, since i've made a few pair and haven't loved them. theirs looked solid. but they were really popular for their 'know your cuts of lamb' t-shirts (check out the site. so funny). i didn't get pictures of many other things (like the aforementioned a verb for keeping warm), and i am sure i am missing many other wonderful conversations and booths and smiles. like the woman at berroco who photographed colden because he is the cutest baby ever - she said if we were on the east coast, he could definitely model for them. it was simply spectacular. and i didn't even attend classes, or the many other going-ons. oh, and that goddess reference up top? well, none other than barbara walker was present. and as i was about to leave on sunday (having totally over-extended colden's good graces), whom should i see coming down the escalator? none other than barbara walker, inventor of ssk (slip slip knit), barbara walker, author of the skeptical feminist, barbara walker, author of restoring the goddess, and also author of the four knitting treasuries most well-known and widely used. i was scooping colden up, as he was trying to climb the descending escalator, and i locked eyes with her. did i smile? did i bow down? struck again, i gathered up colden and our things and walked dazedly out of the convention center. wow. i'm excited! 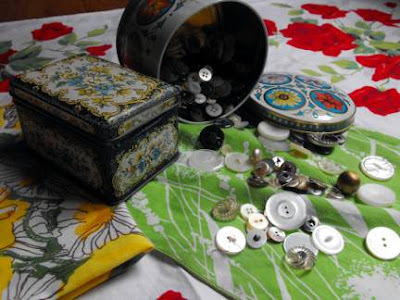 i also have to confess that i've been finding some fabulous finds this summer, including the above linens and buttons and tins and more! i intend to share them by and by, especially if they make their way into, or onto? projects. 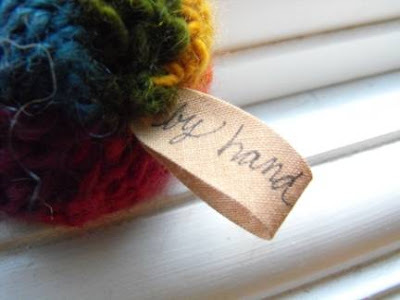 for instance, buttons can be seen on byhandathome, gracing fingerless mitts and arm warmers. 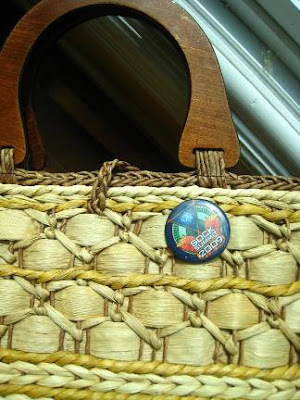 and all of my embroidery hoops have been coming from the estate sales. today i scored a whole slew of them for a dollar, and came away with a pretty little box i intended to put my needles in. however, colden fell for it too, so we may have to share. he liked the idea of putting needles in there, of course. i was inspired to do this one late evening after the boy was in bed, and marc was off doing something else. i actually remember seeing a woman selling similar (even cuter) play kitchens and fridges at the alberta last thursday event a long, long while ago. hers had little handles and faucets affixed. mine requires a little more imagination. i even stitched up a little hand towel (it's hanging on the 'sink' area), and some impromptu pot holders (sitting on the 'stove'). i've since added some blue tissue paper to the sink, to give that watery feel, and i'm going to draw a little burner on that stovetop. i just need a few little pots and pans that will fit in there too! dig the beer boxes? i have more from our move that i might experiment with (they are even labeled 'kitchen' with sharpie on the side). originally i was going to tape it all together, but i couldn't find the tape. lucky for me, because i sewed it instead and it's much nicer. i think it will hold up better too. the shelves do need reinforcement though, anything heavier and they would fall. i started a refrigerator box to go with, but so far it's, well, a box. 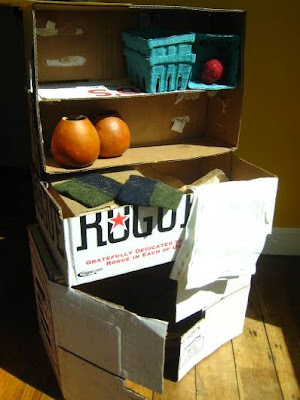 yay recycling -> practical artful toys! september is a wonderful month, isn't it? so many celebrations! this project was for one of my greatest handwork teachers thus far. i worked alongside her as an assistant and learned lots of essentials i didn't know before. pattern-reading, altering, creating, lots of handsewing stitches, how to really crochet shapes and hats, and how to teach these things too! in other words, a tall order. she is expecting a baby girl (any day now they say), and red is her favorite color. 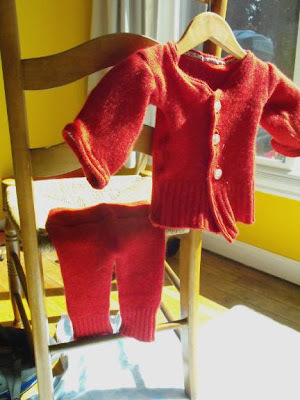 this luxuriously soft cashmere sweater was destined for baby-wear, and i sewed the sleeves into pants in short order. i've kinda got that process down, but the sweater jacket was a little more challenging. i added some flowery vintage trim (25 cents at an estate sale) to cover my rough edges, and some sparkly buttons (also estate vintage) that looked similar to other things on ms. gloriana's wishlist. i think it will probably fit a lot better at a year and a half than 0-3 m., but isn't it sweet? i intended to make a hat too, but ran out of time. i've had a lot of crafty deadlines lately, including an application for crafty wonderland (due today! ), which we attended for the first(!) time on sunday. i can't believe i'd never gone. it was spectacular!!! and i'd love to share more about that too - but for now, i'll leave a little link to the things i submitted as part of my app, here at: byhandathome.com if you see something you like, let me know. i'm working on re-tooling my etsy shop and getting some things up there too. i'm happy to make things specifically to your liking, especially if you are a dear friend, which you probably are if you're reading this! and thank you for doing so, i appreciate it! i had a few wild ideas for some handmade gifts for our friends' wedding. but true to my nature, i left the making of them until the last possible moment and crafted into the wee hours of the morning (just a few hours before we got to the airport). and marc even convinced me to take sewing along for the trip (but that is another project). i also glued a backing on, with some really old craft glue. so it isn't as nice as it could be. luckily, i have plans for another. at the wedding there were special kippahs for 'michael & ray's great adventure', and i can't pass up the opportunity to commemorate that, in the style they chose (complete with tree icon - i came close earlier with a leaf design! if only i had known!). so if you are a friend of ours getting married (*hint, hint*) and have an idea or icon - speak now or forever hold your peace or let me know later, cause i don't mind making lots of these. so fun! i'll take custom orders for your friends getting married too! ray is one of my dearest oldest friends, and i actually hadn't met michael except through pictures. most of which were adorable photos of the two of them wrapped in each other's arms. after seeing those, i had to make these bendy people, who can spoon in as many ways as the real couple (a few wedding guests took care to point this out in a rather illustrative manner). i was totally in love with all of the yarns and fibers from a verb for keeping warm because they are truly natural - dyed with nature. and there were lots of informative tidbits on history, how-to, and even dyestuff available. 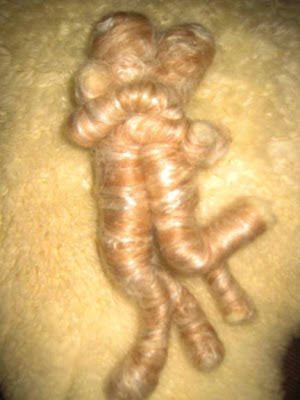 their logo is even curly! unfortunately, my budget was limited, so i will have to come back for some more fibery goodness another time. 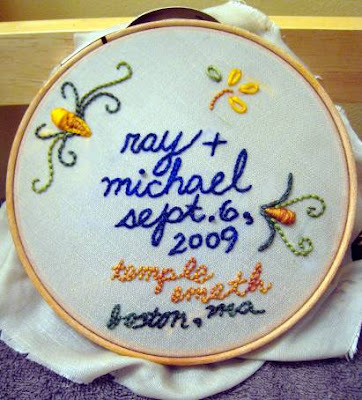 happy wedding, michael & ray! i did have this ready to post last wednesday, but things have been a little nutso around here. forgive the tardiness, please. yay! i accentuated the fact that this little cross-stitch of mine looks like a teddy bear. see? 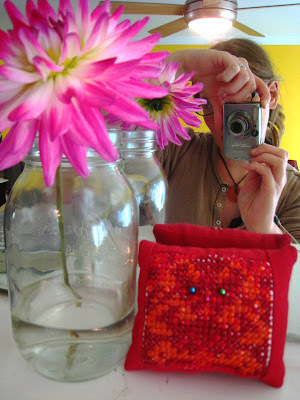 (bonus background - our yellow walls, and a dahlia from the front yard!) i didn't intend to make the bear, nor did i know i could achieve such a likeness! i was doodling a curli-que fountain as i did in paper margins in days of yore. 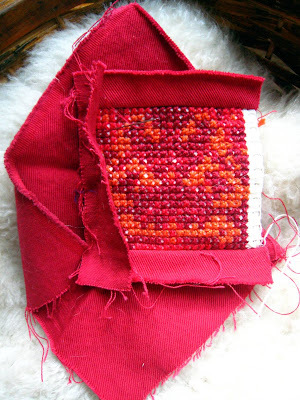 this piece began in my waldorf teacher training, and was never finished because i was convinced i didn't have enough fabric to complete the fourth side (and make the fabric grain match) and the back. i will leave many a thing undone because their perfect end is not within my means (or so i think). anyway, i decided i could always put a denim back on, and then voila! there was just enough. it's kind of karmic to finish this one. i remember the teacher saying she never liked to let children leave work undone with her. so, phew! paid my dues, pin-cushion! ("more wool, more wool!") he is extraordinary at stuffing.